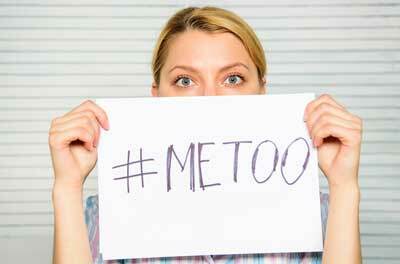 The #MeToo movement opened a floodgate, giving a voice to victims of sexual abuse and harassment. While public revelations have empowered some women, others are reliving past sexual abuse incidents, leading to recurrence of psychological issues. In recent years, stigma surrounding sexual abuse has decreased somewhat, according to New York psychologist Julia Vigna Bosson, Ph.D. “It’s not completely gone, but as more come forward, it seems to break down barriers and give survivors courage to seek help,” she said. On the other hand, watching a woman talk about her story could be a trigger. “This doesn’t mean the person should put on blinders, but it might mean she should seek support,” said Bosson. Sexual abuse causes trauma that shakes the belief system and interferes with a person’s understanding of the world. Avoidance is common in trauma survivors, and while it can seem to help initially, ultimately the person needs to confront what happened. Getting the person in the door is a big accomplishment and should be rewarded by validating their courage, Bosson noted. Bosson emphasized that before beginning any in-depth treatment, the therapist needs to “be present” and make a connection with victims of sexual abuse. “It’s important that the person feels comfortable. You have to allow the individual to express herself and listen from a non-judgmental stance, provide support and empathy,” she said. Catherine Cauthorne, Ph.D, private practitioner in Peterborough, New Hampshire, noted in the 1980s, women were not very upfront in reporting sexual abuse. “Some thought it was to be expected. They were not supported in seeing it for what it was. Sharing it in therapy they learned was not a good thing,” she said. Campaigns like #MeToo and institutions are more willing to deal with inappropriate sexual behavior. However, the biggest challenge lies with women who are still in contact with their abuser. If the person is a relative, the woman is constantly retriggered. “She thinks she doesn’t have the right not to see the person. It’s very hard to divorce yourself from family,” Cauthorne said. Furthermore, sexual abuse that occurred in childhood can affect the sense of self and trust later in life. Children expect parents to take care of them; when they don’t, self-esteem suffers, according to Cauthorne. Cauthorne uses “flash,” a therapy that prepares the patient for EMDR (Eye Movement Desensitization and Reprocessing), which is sometimes too intense for patients. Cauthorne also uses sensory motor psychotherapy, some cognitive behavioral therapy (CBT), self-regulation, meditation, journaling, and noted that yoga often helps. “It’s important to do as many different things as possible. Reach out to family and friends, if they are supportive. In some cases, there might be a referral for medication,” she said. Megan Turchetti, Psy.D, who treats outpatients with trauma in a New Hampshire clinic, pointed out that it’s not uncommon for a long-time patient to reveal incidents of childhood sexual abuse months or even years after they occur. She cited ACEs (Adverse Childhood Events Study) that found a wide-range of mental and physical health issues as a result of childhood abuse. During the last 10 years, child advocacy centers have become a bridge between the criminal justice system, social workers and mental health professionals for concerns about childhood sexual abuse. Children are also gaining support from trauma-informed classrooms in which trained individuals can recognize and address trauma, and The National Child Traumatic Stress Network offers 20 to 30 evidence-based approaches for treating those who have been traumatized, according to Turchetti. Turchetti believes that a prevention mindset would enable psychologists and society to reach out to young people and empower them to speak up about sexual abuse as soon as it occurs without fear of shame or judgment. Women may hesitate to seek counseling from a male therapist, and with good reason, according to Martin R. Pierre, Ph.D, member of the Massachusetts Psychological Association (MPA) Board of Directors and staff psychologist, Brandeis University Counseling Center. that some women may have concerns about their safety and ability to self-disclose to a male therapist. It may affect the willingness to engage in therapy. “As a function of sexual trauma, the woman felt she had no choice in the matter,” he said. So, he provides the power of choice by giving women the option of working with a male or female therapist. He said that the outcome could be a healthy therapeutic relationship with a male. “It’s useful to encourage women to work with a provider of different gender who respects appropriate boundaries. It may result in an emotionally corrective experience,” Pierre said. In addition to EMDR, Pierre uses strength-based therapy that focuses on what is right with the woman.